West Virginia coal miners listened intently at a Donald Trump rally in August. By September, Trump wasn’t talking about bailing out coal anymore. 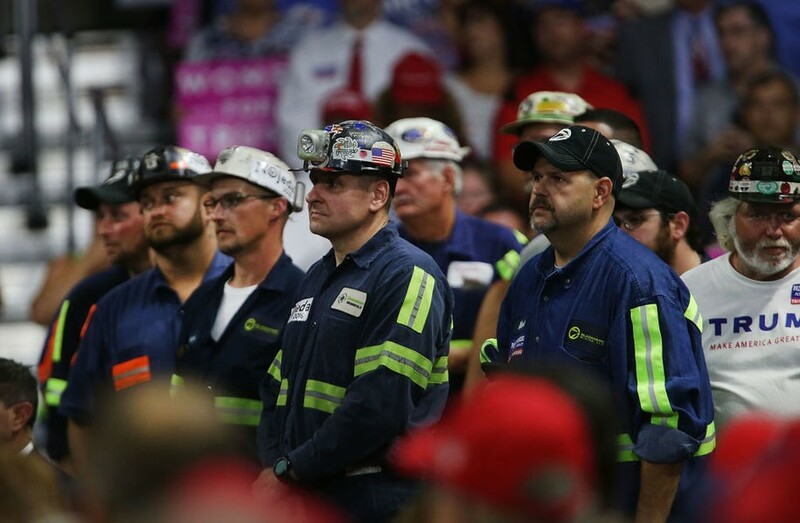 Of all the empty promises Donald Trump made on the campaign trail in 2016, perhaps the cruelest one was the vow he made to coal miners that the coal mining industry would come roaring back. It hasn’t. And it never will. In the first year of the Trump presidency, the administration announced with much fanfare that it would develop plans to prop up and subsidize both the coal and the nuclear industries. That was supposed to be a project run by Energy Secretary Rick Perry, who proposed several plans over the last year to force power companies to keep coal plants running, all in the name of national security. But none of the bailout plans went anywhere, and it seems that the administration has thrown in the coal-stained towel (at least for now) in the move to subsidize the failing industry. The main concern was who would pay for the multibillion-dollar bailouts. On top of that, electricity generated from coal-powered plants has hit a 35-year low. Coal company bankruptcies in states such as West Virginia and Colorado also are increasing. The main thing keeping the industry going right now is coal exports that go overseas to make steel, not to produce energy at home. Using less coal is good news for the environment, as coal is one of the dirtiest sources of energy. “Coal generates the most CO2 emissions of any fossil fuel and yet remains the world’s dominant energy source,” according to the World Resources Institute, mainly because so much coal is still burned in China. But it’s bad news for people hoping for jobs in the industry, especially the miners who lined up behind Trump in droves in places like West Virginia. “We are working now on a military plan that’s going to be something very special” for coal, Trump said while addressing a rally in August. But when he arrived in West Virginia last weekend, there was no reference to anything close to a military plan. He instead made references to supporting transmission lines and coal exports. In 2016, Hillary Clinton got hammered over and over again for a quote she made during the presidential campaign—always taken out of context—that “We’re going to put a lot of coal miners and coal companies out of business.” Trump and Republicans turned the quote into Clinton’s “war on coal” and, by extension, coal miners. It became known as the best-known “gaffe” of her campaign, and it turned many voters in coal country against her. Trump went on to win West Virginia and its five electoral votes with 68.5 percent of the vote—the highest vote share in any state. What Clinton meant, of course, was that coal is a dying industry, and that the country needed to invest in new jobs involving clean and renewable energy for those out-of-work coal miners. Never mind the fact that her campaign proposed a $30 billion plan to help coal miners and their communities. The message was baked in; she was against coal, and Trump would be its champion. Too bad that reality shows a different set of facts. Employment in coal mining has been going down steadily for years. The U.S. Bureau of Labor Statistics reports that, over the last 10 years, the industry has gone from slightly over 80,000 coal industry jobs nationwide in 2008 to slightly over 50,000 jobs now. There was a tiny uptick of 1,000 or so new jobs after Trump’s election, but that’s essentially leveled off. Of course, that didn’t stop Trump and former Environmental Protection Agency Administrator Scott Pruitt from claiming that there had been “50,000 jobs” added in coal—statements rated false by Politifact, even if there’s some quibbling about what exactly constitutes a job in the coal industry. Leave it to the Trump administration to bail on a bailout policy not because it would further poison the environment, but because conservative groups didn’t like it. Coal is losing market share to natural gas and to renewable sources such as solar, wind, hydropower, biomass, and geothermal. Fossil fuels still make up about two-thirds of all electricity generation in the U.S., but the renewable share has been growing and made up 17.6 percent of all electricity production in 2017 (the rest is in nuclear). Renewable energy is now the fastest-growing source of electricity production in the U.S.
And what about all of the coal miners waiting for a mining miracle? Unfortunately for them, they’ve rejected numerous attempts at job retraining, instead putting their faith in Trump’s shallow promises. The reality is that the Appalachian coal mining region “has lost about 33,500 mining jobs since 2011,” according to another Reuters story. Maybe they can feed their families by reselling their MAGA hats on eBay. Originally posted on Daily Kos on Oct. 21, 2018.